Welcome back to another fun day of creating. 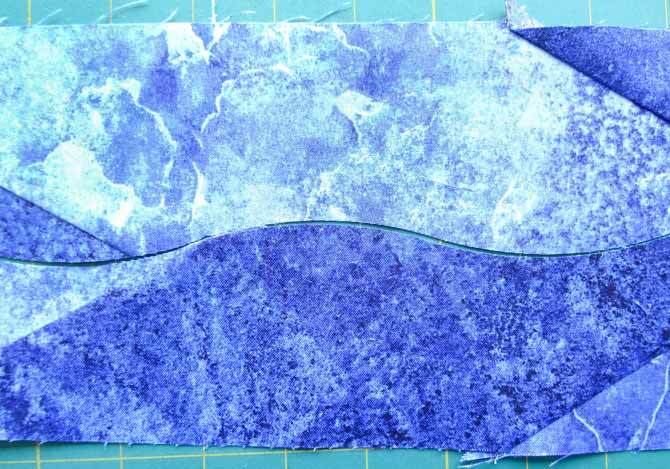 Yesterday with the help of the Sew Easy Half Diamond Ruler – 4½” x 14¼” I created the beach section of the art quilt. Today I’m going to the sea! 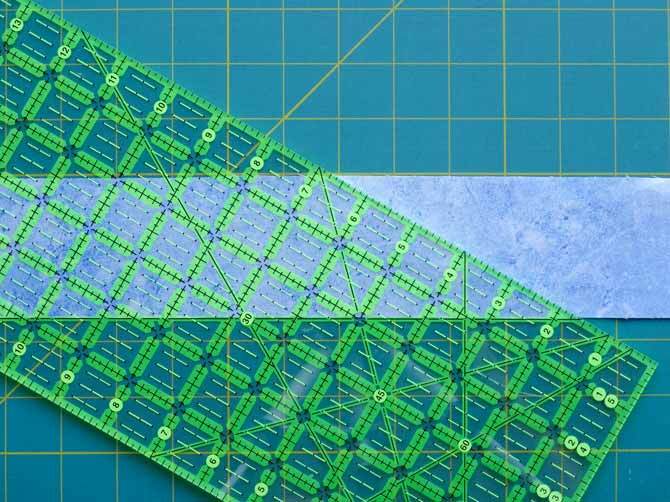 To help further along that Impressionism look to the scene of my art quilt, I’ll use the KOMFORT KUT Slash-N-Circle Quilting Ruler – 9⅞” x 12½”. 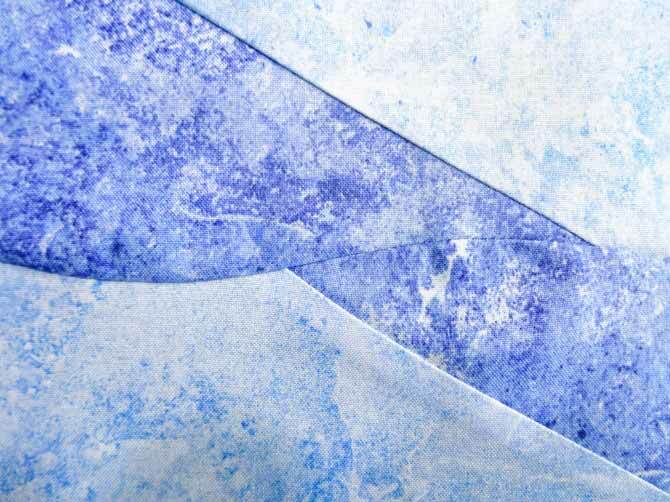 For the part of the sea, I’ll use three shades of blue from the Northcott Stonehenge Gradations Brights collection . Here’s what to do next. Cut 2 strips of each of the light and dark fabrics and 3 strips from the medium colored fabric all at 3” wide. 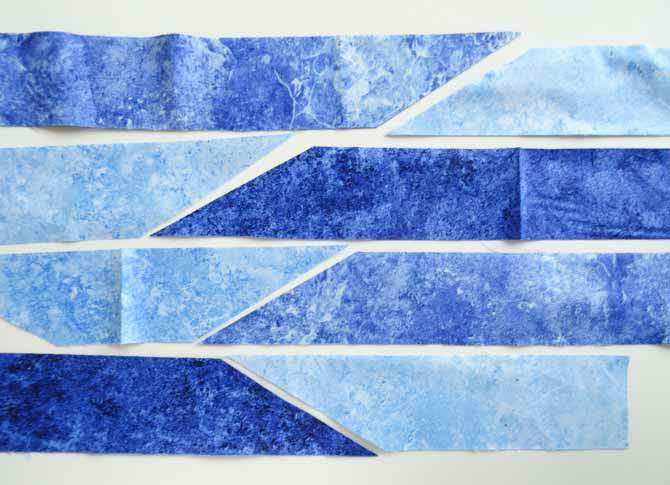 Once your strips are cut, cut them again in smaller lengths; cut them in 4 to 6 pieces at a 30o angle as shown below. Cut your strips at a 30° angle. After cutting the strips, mix and match the cut pieces so that there’s a great variety of colors. The rows need to be approximately 46” to 47” long. As I did for the grass and the beach sections of the art quilt on Monday and Tuesday, I’ll place more of the light colors on the bottom and more of the darker colors on the top; so keep that in mind while you’re playing and laying out your fabrics for your art quilt. Cut pieces of fabric place randomly so get a small preview of today’s project. If you wish, you can make your rows by sewing the pieces using the method I showed you in yesterday’s post, where the pieces were squared up to the same piece in the row that followed. Another way to give the sea an Impressionistic look is by not matching up the pieces from one row to the next, simply place the pieces randomly in every row, then sew the rows together. As in the picture below, I prefer to have the lighter fabrics at the bottom of the section and gradually place the darker fabrics at the top. Once your strips are completed lay them in the order that appeals you. 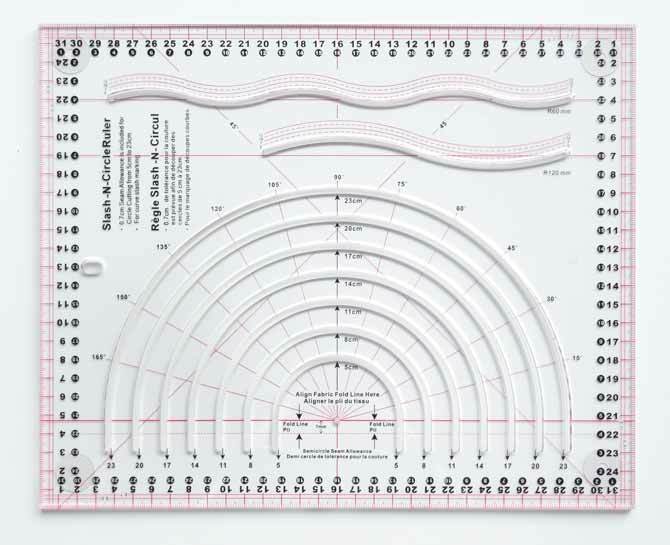 The next step, requires the use of curved lines found on the KOMFORT KUT Slash-N-Circle Quilting Ruler. For this ruler, I strongly suggest that you use the KOMFORT KUT Rotary Cutter – 18mm or the KOMFORT KUT Rotary Cutter – 28mm as they’ll fit better in the curve slots of the ruler. A larger rotary cutter won’t work. Overlap two of the strips by about ½” to ⅝”. 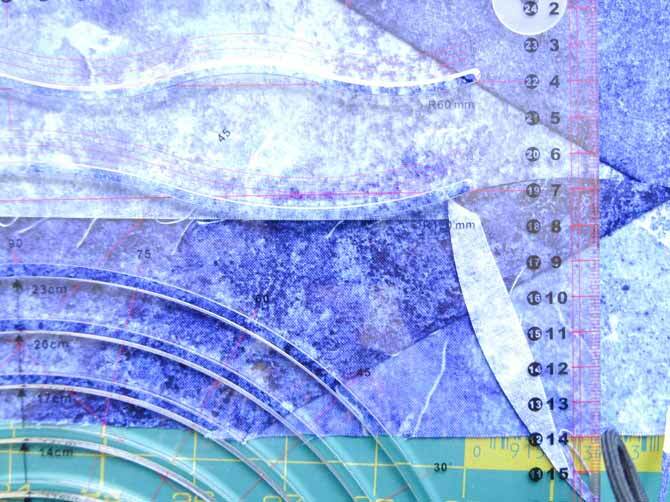 Overlap fabrics ½” to ⅝” before cutting the curves, it will make it easier to get matching curves. For this project I’m choosing the least wavy of the two curved options on the ruler. Place the chosen curve where both fabrics overlap. Ideally, it’s best when the curve on the ruler starts off the edge of the fabric and the other end of the curve on the ruler is about ⅛” from the edge as shown in the photo below. 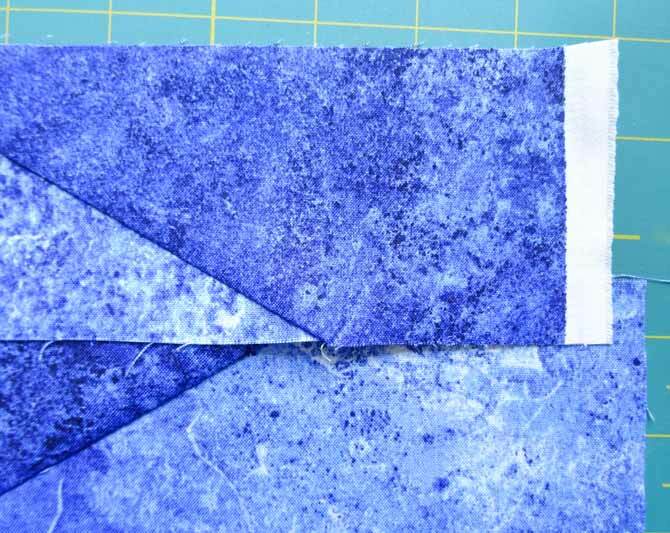 This makes it easier to start and finish the cut on the fabric. However if your piece of fabric is longer than the ruler, lift the ruler and move it forward to continue the cut. Position the KOMFORT KUT Slash-N-Circle Quilting Ruler where both fabrics overlap. A little trick that I use to better see where I’m placing the ruler is to fold down the cut fabric on the upper layer so I can better see where the end of the cut is. I then use this as the starting point to continue cutting the curve. I continue this process until the full length of the of the strip is done. Reposition the ruler until the entire lenght of the row is cut. Once the curves are cut and the edge pieces of fabrics are removed, just like a puzzle the strips of fabric match up exactly. Sewing the two curved strips isn’t as difficult as you might imagine. The first thing to notice is that since this is a soft curve it will be easier to sew. The second thing that can make these strips easier to sew is to apply a ⅛” seam. The third thing, as you’re sewing, stretch the fabric ever so slightly; pull, tuck and/or push one or both fabrics. Sewing curves isn’t a race. Take your time, slow and steady, only doing 2 to 4 stitches at a time is normal and strongly suggested. Once you’re done, press the strip flat. Two rows sewn, showing a beautiful curved line. Now let’s proceed to add the other rows to complete the ‘sea’ for this art quilt. Once you’ve sewn all rows together you should have a piece that looks somewhat like this. There’s a curved seam between all the rows. When working with multiple rows of curves it’s possible that two things will happen. The first is that once the sewing is completed you’ll see a bow on the top or bottom or both. I wouldn’t worry about that. The reason I say so is that it can be fixed by squaring off the piece. As for my piece, before I square it off, I’ll wait to see what all 4 sections look like once completed. The second thing that can happen is some bowing within the work. If it happens it should be minor. My fix for it is before quilting it, I add a little starch to the piece that’s bowing. The most important tip to remember is that the more you work on curved pieces the better you get at it. 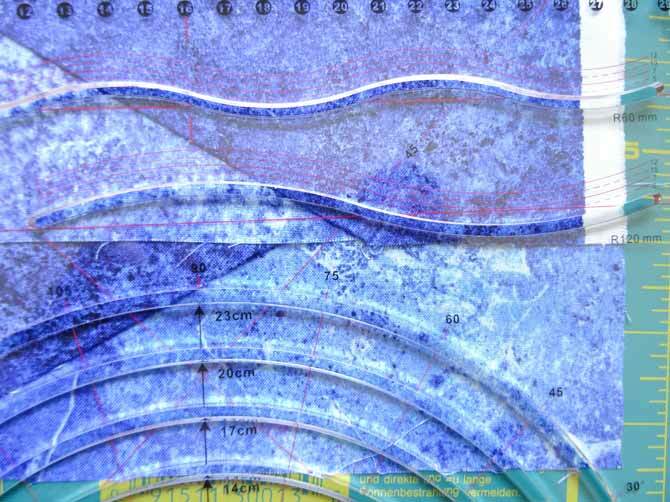 I hope that you enjoyed using and playing with the KOMFORT KUT Slash-N-Circle Quilting Ruler – 9⅞” x 12½”, as you prepared your portion of the sea. Come back tomorrow when revisit the Sew Easy Triangle Ruler 60° – 8″ x 9¼” and the Sew Easy Half Diamond Ruler – 4½” x 14¼” to continue the art quilt. Paul — I want that piece of sea fabric. It looks awesome! I’ll make one just for you.